Well, here – reposted from the original at Jonny Bentwood’s Technobabble blog, is the low down on TweetLevel, how it works, what it’s for and why it matters. May the debate begin. 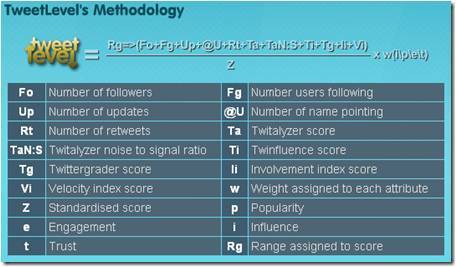 TweetLevel is a new measurement tool that calculates someone’s importance on Twitter. In other words it is the Twitter equivalent to Google’s PageRank. The explosive growth of Twitter has massively impacted the nature of communications. Initially the domain of the tech-minority, it has now reached a maturity level where it has branched out to multiple demographics. My personal view is that as long as Twitter is the tool that key audiences use then I will use it too – if everyone changes next week to product X, then I will too. However, as a communications professional, it is my job to take part in the conversations that my key audiences are having no matter where they take place. One of the common questions Edelman is asked is ‘who should I spend my limited time with?’. It is this question that has forced companies to tier their audiences depending upon their impact within the wider community. 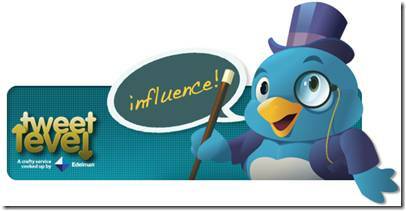 One of the common problems associated with ranking twitter users is the misconception that popularity = influence. This couldn’t be further from the truth. Popularity has its place but it should not be the only metric that defines ‘importance’. TweetLevel aims to answer this question. To illustrate how this works, I have selected four individuals who each excel in different areas. What this shows is not a measure of an individuals ‘importance’ in the world or even social media but simply how they use Twitter. With close to 2.8 million followers this account is exceptionally popular. However, by contrast its engagement score is very low – this is because all the account does is broadcast its opinion (and links) without engaging in conversations with other people. However, without doubt it is exceptionally important as people believe what it says (as shown by its trust score) and its content is retweeted frequently. Calvin Lee at Mayhem Studios has a high influence score, but a low number of followers as compared to other people in the top 20 TweetLevel names ranked by influence. With less than 40,000 followers Calvin understands that within Twitter it is micro-communities that count not necessarily who can win the popularity contest. Calvin also has a very high engagement score as a result of interactively discussing frequent, relevant and interesting content. Congratulations to T-Mobile for understanding that the key to using Twitter as a tool is to have two-way conversations that are informative with their community. They have mastered this medium and have been ranked top over a list of millions when it comes to who has the most engaged Twitter account. Just as PR has gone to public engagement, and AR has gone to analyst engagement, it is only natural that I believe that instead of mass-broadcast (shown by popularity) or mass-amplification (shown by influence), I believe that the purest form of interaction is via multiple targeted micro-conversations where people actively engage and interact with the niche community. This is why when scores are weighted for ‘engagement’ the ‘involvement index’ becomes the most important factor. Robert Scoble in his recent post discussing the merits of Twitter’s Suggested Users touches on engagement. He explains that the number of followers someone has (i.e. their popularity on Twitter) should be turned off and the answer… engagement. Turn off follower counts for everyone and come up with a new “engagement score” that is more focused on how you use Twitter and how people engage with you. Couldn’t agree more which is why TweetLevel has such a high weighting on this metric. It is this final measure of trust that has been the most discussed during beta testing. After all how do you measure trust on Twitter? Although not the only factor that decides this ranking, in my opinion if someone is prepared to associate what someone else has said with them (via retweeting for example), then this indicates a measure of trust. Whereas some Twitter users achieve this via posting news (such as CNN), others such as Paulo Coehlo have achieved a magnificent trust score by tweeting content that other people wish to spread throughout the twittersphere. Seems to me what’s useful with Twitter is creating a small, two-way community with people who aren’t busy running a Twitter team and who have time to SHARE ideas. Rather than broadcast them. Simply go to: www.tweetlevel.com now and find out your score. While you are at it, try a few other people and see how you compare to them. I welcome your feedback as to how this can be improved or your comments in general. Twitter Lists – without a doubt this feature addition to Twitter will significantly change the influence score. Even though Twitter has released their API to us, this particular metric is not yet included. When it is, a TweetLevel score will increase depending upon the number of times a user is included in a list, the number of people who follow that list and the authority of those people. Twitalyzer noise to signal ratio – Signal-to-noise ratio is a measure of the tendency for people to pass information, as opposed to anecdote. Signal can be references to other people (defined by the use of “@” followed by text), links to URLs you can visit (defined by the use of “http://&#8221; followed by text), hashtags you can explore and participate with (defined by the use of “#” followed by text), retweets of other people, passing along information (defined by the use of “rt”, “r/t/”, “retweet” or “via”). If you take the sum of these four elements and divide that by the number of updates published, you get the “signal to noise” ratio. Twitalyzer gives users scores from 0 to 100. Ranges were determined (i.e. more than 20, more than 30, etc.) and each range was assigned a number (0 to 20) that was used as part of the algorithm. In the true spirit of ‘open sourcing’ this work, I welcome your comments, views and criticisms in how this approach can be as accurate as possible. Whereas I don’t believe for one moment that TweetLevel has found the holy grail of social media measurement, I think it is a good step forward and look forward to discussing this with you. Can I ask, is the weighting linear? Thanks. All weighting is logarithmic and variable depending upon whether the key ranking metric you want to analyse is popularity, influence, engagement or trust. For example, if I wanted to find out who was the most popular I would have a far greater weighting on number of followers and lists inclusions/followers-of, whereas I would have less significance placed on how effectively someone communicates with other people. Interesting. Why logarithmic vs. linear? The principle behind logarithmic weighting is that the majority of people have a few followers compared to the handful of superstars who have millions. A logarithmic scale will reward the people who have a far more significant rise on the lower end compared to a jump of 1m+ at the high end. Absolutely, but aren’t you just upweighting what logically are less influential upticks at the lower end. In other words, why are you exagerating an increase of a few hundred at the lower end compared to a few thousand at the upper end? By using this scale, it rewards people for overcoming early obstacles when their visibility is very low. Thanks Jonny, I think the idea that TweetLevel rewards those who are starting out is lovely. But I think my question is ‘being kind to the newbies’ the logic which should define the weighting? Is there any other reason that we should use a logarithmic scale vs. linear? I think you are missing the point – its not to rewards newbies is that whenever you try and rank anything that has a very large range (from earthquakes, sound and yes twitter influence) then you need to have a logarithmic scale. What tweetlevel does is help people find important people within micro communities. I don’t care who has 7 million followers – I care who engages well within a specific niche topic area. If you have a linear scale then important people by area would be impossible to find as they all would have a score of less than 1.00 as the superstars and their huge number of followers would take up 99% of the scale despite them only accounting for less than 1% of the twittersphere. Quite possibly I am, it’s much easier to talk about log functions face-to-face! But I would also argue that there are many examples of large scales which are kept linear (e.g. time, distance, currency).